When developing an artifact, designers must first capture and represent user needs. These needs can then be transformed into system requirements or objectives. The contribution of this work is rooted in the formalization of the affordance-based approach for capturing user needs in the early stages of design. 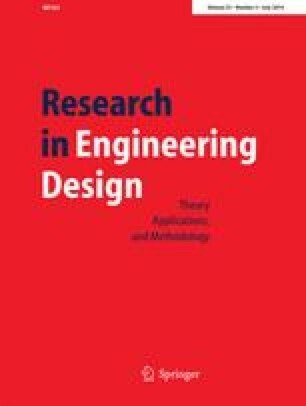 This formalization comes in three forms: the first affordance basis for engineering design (a defined set of affordances), a formal structure for affordance statements, and a new relational model structure. This formalization is intended to improve model quality and consistency, while managing model creation resources. Further, this affordance-based approach to capturing user needs imposes a level of abstraction that forces solution independence yet is capable of capturing the large range of user needs. As such, the approach provides a structured approach to problem abstraction—the process of specifying user needs without reference to specific solutions. This affordance-based problem representation relies on other design process tools to help develop the actual artifact, which is also discussed. See Tables 12 and 13 and Figs. 10, 11, 12, 13, 14, 15, 16 and 17. Does the artifact interact with more than one individual at a time? The artifact interacts with the driver, passengers, pedestrians, and other vehicle operators. Who receives a direct benefit from the artifact? Who is the product used around? The product is used for both highway and city driving. As such the product is used around pedestrians, cyclists, motorcyclists, and other vehicle drivers. Who cares for, maintains, or monitors the artifact? The owner typically cleans the vehicle, though they may hire someone to do this. Someone will fulfill the role of mechanic to address any routine maintenance or repairs. Monitoring of the system health may be done by the owner, mechanic, or the car (via sensors). Who is available to assist a user when they have a problem with the artifact? Roadside assistance may be an option or provided. Some dealerships will assist with integration of electronics. Not considered for this problem. What artifacts rely on the principal artifact for inputs? What artifacts rely on the principal artifact for control? The passenger car is sometimes used to control garage doors and gates. The cars electronic interface is sometimes used to control peripheral electronic devices like cell phones and mp3 players. What artifacts rely on the principal artifact for physical augmentation? What artifacts use the principal artifact to augment or add functionality? What artifacts does the principal artifact rely on for inputs? What artifacts does the principal artifact rely on for control? What artifacts does the principal artifact rely on for physical augmentation? What artifacts does the principal artifact rely on to augment or add functionality? Certain peripherals are used to increase storage space, such as bike racks, storage boxes, etc. What artifacts are used alongside the principal artifact toward a larger goal, but do not interact directly with the artifact? Toward the larger goal of transportation, ferries and trains are sometimes used to transport both the principal artifact and passengers. What artifacts are used before or after the principal artifact in completing a larger task? What artifacts are used to prepare the environment? What artifacts generate inputs for the principal artifact? What artifacts encapsulate the principal artifact? Sometimes the principal artifact is found inside a ferry or train. What artifacts inhabit (or operate within) the principal artifact? Within the principal artifact a number of electronic devices are used. Other peripherals used for passenger entertainment are also used with the principal artifact. Child restraint devices are often used as well. Artifacts associated with the consumption of food or drinks are common as well.